In this study of 1616 consecutive dog bite injuries treated at Children's Healthcare of Atlanta, the only pediatric Level 1 trauma center in the state of Georgia, there were 46 breeds of dog identified. The 3 most prevalent were 38.5% pit bull (also identified as Staffordshire bull terrier, American Staffordshire terrier, or bull terrier), 13% mixed breeds, and 8.1% labradors. Of the mixed breeds (n=66), 11 were pit bull mixes, 12 labrador mixes, and 4 labrador/pit bull mixes. Features and morbidity of patients with the most severe injuries. In all 5.5% of patients underwent surgery; of these, 68.5% involved the head/neck region. Of the breeds identified, 50% involved pit bulls. With regard to breed, operative intervention was most strongly associated with a pit bull injury. Pit bull breeds were also more likely to bite in multiple anatomical locations (2.5 times as likely as other breeds to bite in multiple anatomical locations). The lone mortality involved a 5 day-old girl attacked on the head by the family’s pit bull. The child underwent emergency craniotomy. Her postoperative course was complicated by acute respiratory distress syndrome, neurogenic pulmonary edema, and transfusion-related acute lung injury. Despite maximal ventilator support, she was persistently hypoxic and succumbed on postoperative day 3. Pit bull injuries. Our data confirm what detractors of the breed and child advocates suggest—that, with rare exceptions, children and pit bulls do not mix well. 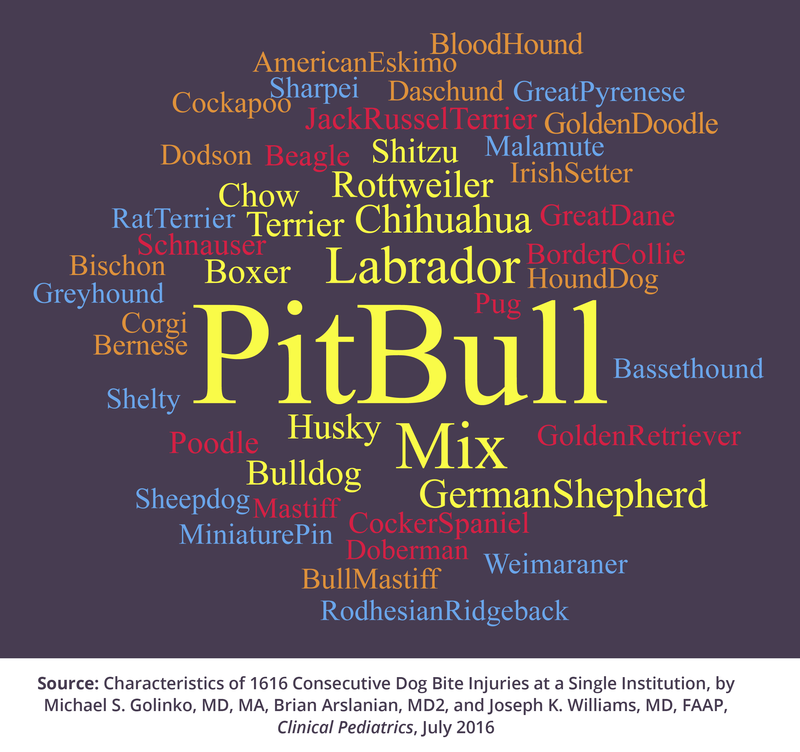 Of the 8 studies listed in Table 5, 6 report pit bulls as the most prevalent breed, and in many cases, they inflicted the most severe injuries. Our data were consistent with others, in that an operative intervention was more than 3 times as likely to be associated with a pit bull injury than with any other breed. Half of the operations performed on children in this study as well as the only mortality resulted from a pit bull injury. The study's authors agree with Bini et al, that attacks by pit bulls result in a higher injury severity score, lower Glascow coma score, higher risk of death, and higher hospital charges than attacks by any other breed. The study's authors recommend strong consideration to avoidance of any interaction between pit bull breeds and young children, particularly infants. Characteristics of 1616 Consecutive Dog Bite Injuries at a Single Institution, by Golinko MS, Arslanian B, Williams JK, Clinical Pediatrics (Phila), April 2017;56:316–325 [July 2016, Epub]. (View related graphic).